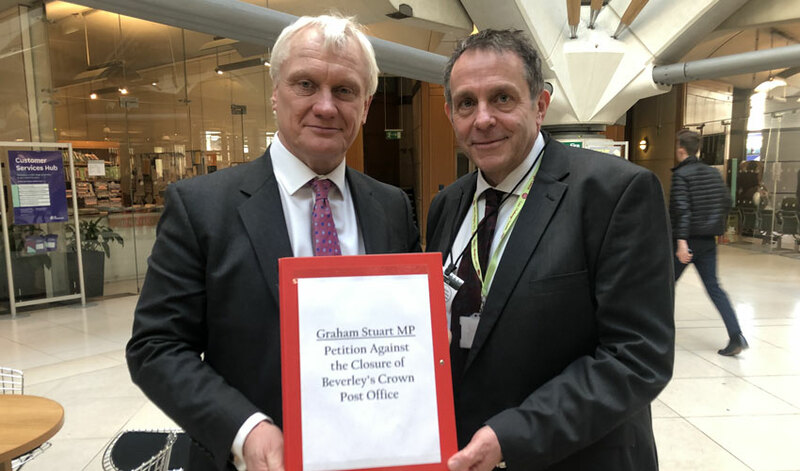 Post Office Director Roger Gale has been handed a petition by MP Graham Stuart. Mr Stuart presented 1700 petition signatures objecting to the proposed closure of Beverley’s Crown Post Office. The MP for Beverley and Holderness handed it to Mr Gale, the Post Office Network and Sales Director. His role is to lead the programme of changes and Directly Managed branch network. Post Office bosses want to relocate the Crown Post Office in Beverley to the nearby WH Smith Store. Under their plans, the relocation will offer enhanced services and also longer opening hours. Plans to relocate 74 Crown Post Offices also have the support of the government. They say it is up to the Post Office to decide how they run their business. The Post Office has also made it that this is a commercial decision which will not be reversed. Mr Stuart, however, is against the plans supported by the government. He wants to see the decision reversed, something the Post Office has made clear will not happen. He also says there has been a solid objection to the plans, however, less than 1pc of the population of Beverley signed the petition. Post Office Limited and their partners WHSmith are having a laugh!